Irish grid reference: Q 4030 0620. Just off the R559 Cois Farraige (or the Carrig) road to the east of Murreagh on the Dingle Peninsula, Co Kerry, stands the 7th century Kilmalkedar Monastic Site, also known as Cill Malcheadair. Here we find a small 12th century roofless Romanesque church, a rare Dark Age sundial, an Ogham and Latin inscribed stone and some cross-inscribed slabs, one of which is called ‘the Alphabet Stone’ and, there are some pre-Christian holed ‘balaun’ stones, holy wells and early medieval grave-markers – in what is a ‘very’ beautiful and holy setting in the far south-west of County Kerry, some 5 miles north-west of Dingle on the R559 road. The first church and a monastery, were established here at Kilmalkedar in c 600 AD by St Maolcethair (Maolcedar), the son of an Irish king (of Ulster). A building called ‘St Brendan’s House’, actually an oratory, can also be found here and, close by the pilgrims’ road (Cosan na Naomh) leads on to Mount Brandon from where St Brendan departed for foreign lands in the mid 6th century. About 1 mile to the south-west of Kilmalkedar is the famous boat-shaped building known as ‘the Gallarus Oratory’, which dates maybe from the 8th century. The Celtic monastery of Kilmalkedar is known from history to have been a renowned school of learning during the early medieval period. The ancient roofless Romanesque chapel dates from the mid-12th century, though there was obviously an earlier religious building on this site, maybe dating back to the Dark Ages when both St Brendan and, later St Maolcethair were in residence here. There are a number of very beautiful architectural features in the church. It consists of a chancel and nave – the chancel measures roughly 6 metres by 5 metres – while the nave is roughly 8 metres by 9 metres. The church is said to resemble the more famous Cormac’s Chapel at Cashel, County Tipperary. In the excellent article ‘Marking The Passage Of Time’ by Patrick O’Sullivan for the Ireland’s Own magazine we are informed that the church was: “built in the Romanesque style of the twelfth century, typical features being the round headed doorway and the high pitched gables”. But there are a number of other features too including the barrel-vaulting and a lower section of the corbelled stone roof, and some carved window surrounds have survived. The chancel dates from 1200; and the west doorway has a ‘tympanum’ with carved stone head. O’Sullivan in his article goes on to say: “The original roof of the church has long since given way but the East Window, known locally as Cno na Snaithaide, the eye of the needle, still remains. It has long been the tradition for pilgrims to pass through the window nine times, especially at Eastertime, when it was believed that doing so would grant them the promise of eternal life”. Standing in the chancel is the famous ‘Alphabet Stone’, dating probably from the 6th century AD, which is 4 feet high, but is broken at the top. On its west face the Latin alphabet and an earlier inscription DNI which is probably ‘domini’. The north face has a thin, damaged cross while the south face has an equally thin Latin cross with scrolled ends. And outside in the graveyard a 6 foot high slender Ogham stone with a little round hole at the top. 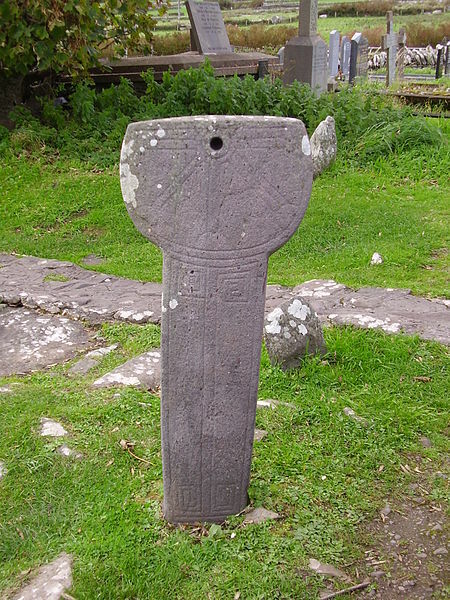 The Latin inscription on this is: ANM MAILE INBIR MACI BROCANN which is translated as: ‘In the name of Mael Unbir, son of Brocan’, and on the opposite side (along the edge) is the Ogham notch inscription reading the same. This stone is thought to date from the 5th or 6th century AD. Also in the churchyard is a 4 foot high rectangular shaped stone with sundial markings beautifully carved onto it. O’Sullivan says of this: “The beautiful sundial is marked with segments which correspond to the divisions of the monastic day”. He goes on to say: “The northwest face meanwhile is decorated with a cross of arcs, the later now thought to be a symbol of pilgrimage, as it appears on many stones associated with early pilgrimage routes”. And further he says: “While the lines on the Kilmalkedar sundial end in half moons, or semi circles, other examples have lines that end in three pronged forks. There are two decorative fret motifs at the top of the shaft of the Kilmalkedar sundial, everything about it evocative of an age when the pilgrims made their way to the holy mountain. It is the easiest thing in the world to picture some of them stopping by the sundial, telling the time of day from the way in which its face was shadowed by the sun”, he says. There are a number of interesting early Medieval grave-markers set among the more modern gravestones, these may indicate where monks from the monastery were buried between the 8th-12th century. 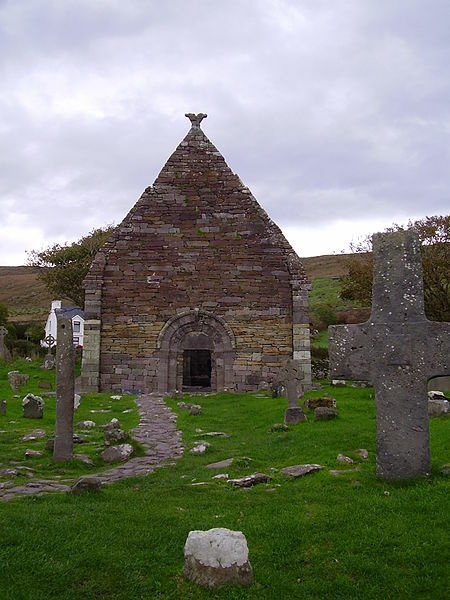 Also, there are two holy wells – one for St Maolcedir, founder of the monastery here, and the other belongs to St Brendan whose ruined, roofless oratory (St Brendan’s House) stands 50 metres to the north. St Brendan’s holy well is located at the south-east side of his two-roomed oratory. Also in the churchyard, a hefty and tall slab-cross with a thin (unfinished) cross carved onto it, and a number of early medieval grave-markers in the form of crosses, including a small T-shaped tau cross. These probably mark the graves of the monks who lived at the monastery between the 8th-12th centuries AD. Some 50 metres to the north, near St Brendans House, there are two pre-Christian balaun stones with several depressions or bowl-like holes in them – though what these were originally used for is uncertain, maybe milk, or some other substance was placed in the holes as a kind of fertility aid, or for healing purposes? During the early Christian period these holes may have been used by missionaries for holy water and, subsequently baptism of the local people. Close by is the pilgrims road (Saint’s Road) which leads from Kilmalkedar to Brandon Mountain from where legend says St Brendan the Navigator sailed across the Atlantic Ocean on his long journey to other lands back in the mid-6th century AD, according to Katharine Scherman in her delightful book ‘The Flowering of Ireland’. Bord, Janet & Colin., Mysterious Britain, Paladin Books, London, 1974. O’Sullivan, Patrick., ‘Marking The Passage Of Time’, Ireland’s Own, (Various Dates), Wexford, Ireland. Scherman, Katharine., The Flowering of Ireland, Victor Gollancz Ltd., London, 1981. Categories: Ancient Churches / Chapels, Ancient Crosses, Holy Site/Place of Pilgrimage, Inscribed Stones, Monastic Sites | Tags: Kilmalkedar Monastic Site in Co Kerry southern Ireland | Permalink.